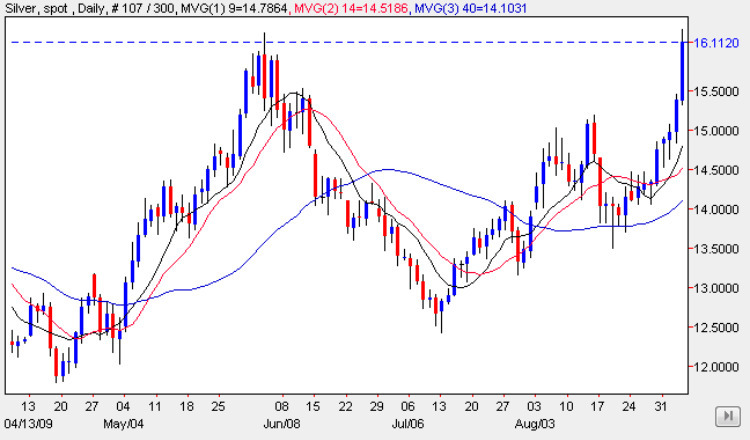 Silver was once again one of the main beneficiaries in the commodities market from the surge higher in spot gold prices following the strong breakout from the pennant pattern on the daily gold chart, with silver following suit and ending the day with wide spread up candle which broke above the $16 per ounce level in one bound! The longer term picture for the price of silver, will now depend on the performance of gold in the next few weeks, and with the precious metal looking certain to breach the $1000 per ounce, then the signs for silver are excellent. Technically we have a deep level of resistance ahead on the daily silver chart, which now sits immediately above in the $16.30 to $18.50 price range, which will take some effort to breach. However, given the strong performance of gold and the significant and dramatic breakout that has occurred in the last few days, the signs are positive and we should see a test of this level in the next few days. With a long weekend ahead, and with the US and Canadian markets closed on Monday for a national holiday, we may well see some profit taking today in the silver market as silver traders square their positions ahead of the weekend, so we could see a dip today following the last two days of sharp gains. However, with a resumption of normal silver trading volumes on Tuesday, the signs are excellent for silver bulls, and should we see the above resistance breached in due course, then an approach on the $21 per ounce level may be possible by the end of the year.